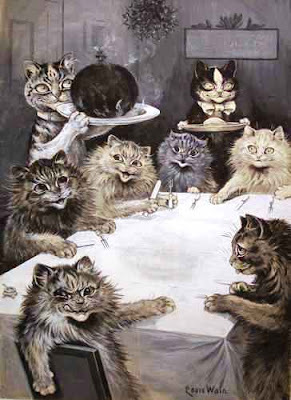 "Every Dog Has His Day And Every Cat Her Two Afternoons"
I'm pretty sure that's a figgy pudding and not a giant bomb that kitty is bringing to the table. Heh - "figgy pudding" used to make my sister crack up when we sang Christmas carols. Thanks for uploading - you are a dear.